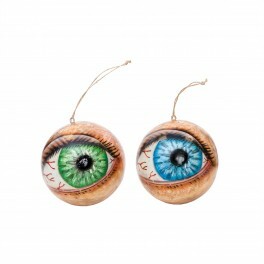 Set of two eye ball ornaments - both colors (green and blue) - save $2. The perfect ornament for the optometrist in all of us. 4 inches in diameter. See separate listing for buying a single ornament. Set of two eye ball ornaments - both colors (green and blue) - save $2. The perfect ornament for the optometrist in all of us. 4 inches in diameter. If you want a matched pair of the same color, order 2 sets and you will have 2 of each color. See separate listing for buying a single ornament.